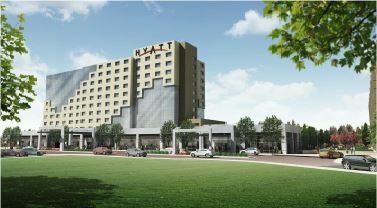 Design and construction of a new 10 story hotel and conference center. LEI Companies has been working toward the completion of the new Fitzsimons Village and Hyatt Hotel and Conference Center, located in Aurora, Colorado. The structure will feature an entirely prefab lighting system, utilizing an upscale light scene on the first floor and dimming capabilities in many major areas. The ten story building will serve both hotel guests and professional audiences, providing top rate accommodation on any level. Beginning on the second floor, the 249 room hotel will include amenities such as an outdoor pool, fitness center, and luxurious club lounge. Additional amenities for working professionals include a cyber lounge, several meeting and ballrooms, and a conference center. As part of the hotel, guests will also be able to have a drink or an exquisite meal in the fully equipped bar and restaurant. Adjacent to the dining area, there will be a full service kitchen, accompanied by a spacious back of house area, which will house administrative staff who are prepared to assist with customer service.